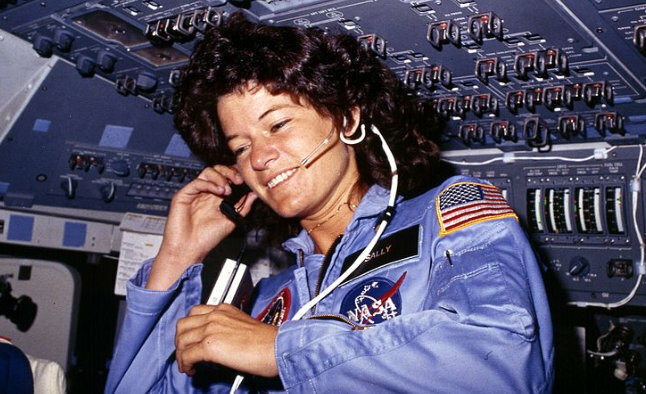 On July 23, 2012 Sally Ride died peacefully in her San Diego home of pancreatic cancer. She was 61 years old. 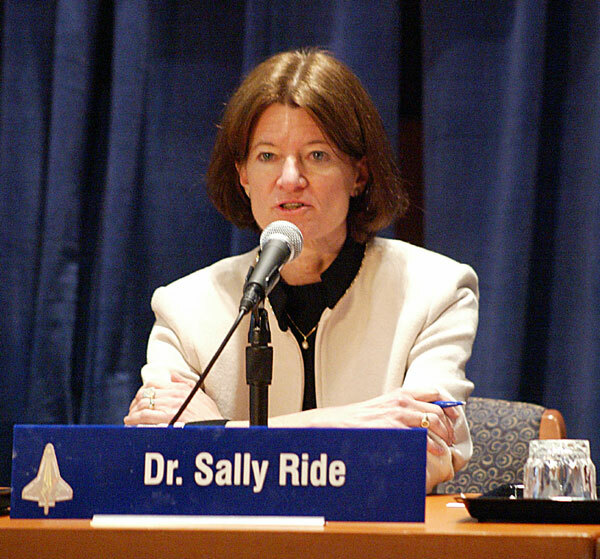 Sally Ride became a household name when she was selected for the STS-7 Space Shuttle mission in 1983. On June 18 of that year, Ride soared into space aboard the shuttle Challenger, becoming the first American woman astronaut. Ride was the third woman in space worldwide, following Soviet cosmonauts Valentina Tereshkova in 1963 and Svetlana Savitskaya in 1982. This NASA file photo, dated June 1983, shows America’s first woman astronaut Sally Ride as she communicates with ground controllers from the flight deck during the six-day space mission of the Challenger (Credits: NASA/Getty Images). Ride was working on her PhD in astrophysics, having already secured bachelors degrees in physics and English, when she saw an advertisement in the Stanford University student newspaper. NASA was looking for astronauts, and this time positions were being made available not just to test pilots, but to scientists and engineers – and women. Ride applied. She along with 29 men and 5 other women were selected from the applicant pool of 8,000. She began training, learned to love flying, and helped design the Shuttle’s robotic arm which she was able to deploy on her first flight. 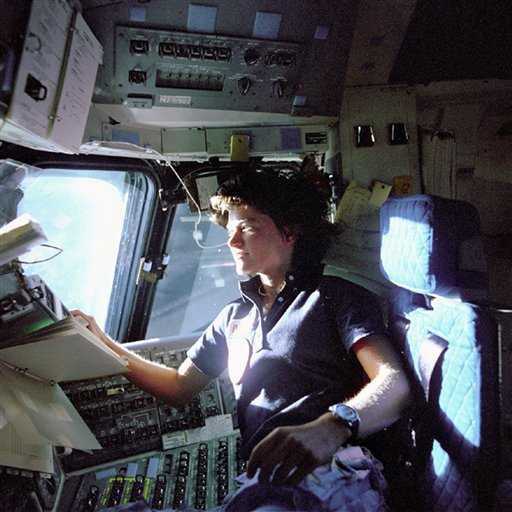 Sally Ride monitors control panels from the pilot’s chair on the shuttle flight deck (Credits: NASA). Ride continued to feel that society should be further along throughout the rest of her career. She made public outreach a major priority, focusing on encouraging girls to become interested in science and in space. In 2001 she founded her own company, Sally Ride Science, to do just that. She also wrote children’s science literature and initiated and directed NASA-funded educational programs such as EarthKAM and GRAIL MoonKAM. Ride flew on two shuttle missions. “The thing that I’ll remember most about the flight is that it was fun,” she said after her first mission. “In fact, I’m sure it was the most fun I’ll ever have in my life.” After her 1984 flight, Ride was scheduled to form a crewmember of the STS 61-M mission. Training for that mission was halted when the Challenger exploded in January 1986, killing all seven crew members onboard. Ride made a point of reaching out to children, especially girls, as when seen here appearing on the television show Sesame Street in 1984 (Credits: Dave Pickoff/AP). Ride never made it to a third spaceflight. Instead, she served on the Presidential Commission investigating the Challenger accident. She would later serve on the commission investigating the 2003 Columbia accident, becoming the only person to serve on both commissions. Ride retired from NASA in 1987 for the Center for International Security and Arms Control at Stanford University. Two years later she became a professor of physics at the University of California San Diego and director of the California Space Institute. She served on innumerable space, science, and policy panels. 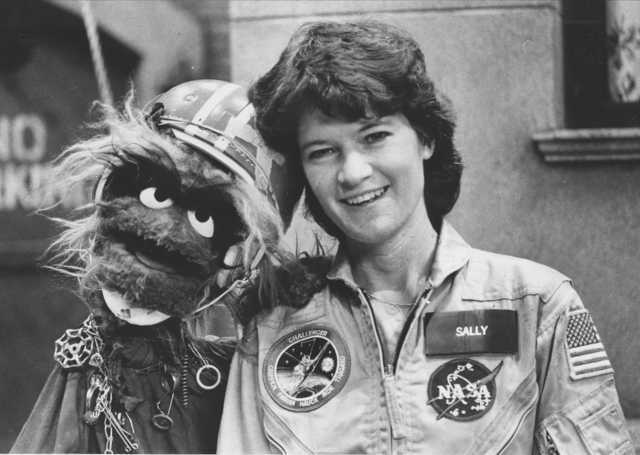 Sally Ride was inducted into the National Women’s Hall of Fame, the California Hall of Fame, the Aviation Hall of Fame, and the Astronaut Hall of Fame. She was awarded the Jefferson Award for Public Service, the von Braun Award, the Lindbergh Eagle, the NCAA’s Theodore Roosevelt Award, twice awarded the NASA Space Flight Medal and in 2012 was honored with the National Space Grant Distinguished Service Award. Sally Ride at the Columbia Accident Review Board, where she was known for asking tough questions. She blamed NASA personnel for forgetting the lessons from Challenger (Credits: Rick Stiles). Ride had battled pancreatic cancer for seventeen months. An intensely private person, she had requested the information not be made public. Although NASA was aware of her illness, they honored her request to not share that information. Ride was survived by Tam O’Shaughnessy, her partner of 27 years, as well as her mother Joyce, sister “Bear,” niece Caitlin, and nephew Whitney.